Lock in a great price for Ancient Sands Resort - rated 8.2 by recent guests. We arrived during the Gouna Film Festival and all of the actors were guests in the hotel and we expected that this might be chaotic and cause problems in check in or staff might give higher priority to the celebrities, however what happened was totally the opposite all the staff were doing their job perfectly well and professionally. While reserving through booking we asked for two baby cribs and upon our arrival we asked for a room with nice view and they were able to manage this and moved the cribs to the other room that we asked for. Also I would like to say special thanks to Mr. Sherif Mohsen the GM of the hotel for his gentleness and care that we get a bigger room and to ask the chief anytime to prepare special food for our babies. Also the room was perfectly clean and new. Breakfast was delicious and the hotel restaurant served lunch was very nice. Absolutely Ancient Sands will be my first choice when traveling to El Gouna. Staff were very cheerful n helpful , hotel is clean v.big. all over stay was perfect n z hotel is nice and z appartment was outstanding. All of the staff were incredibly friendly and so hospitable - they genuinely want you to enjoy your stay!!! My apartment was just incredible and the choice of pools was brilliant! I didn't use the main Piazza restaurant but did get food at the Mint Bar (same menu as the room service) - their vegetarian sandwich was to die for!! A shuttle bus is provided to the beach/marina every hour and also downtown in the evenings, or it is a short tuk-tuk ride. Both the wine and beer were lovely and great value - would definitely recommend this place! Pools are amazing and properly heated. Staff are very very friendly. We rented a 2 bedroom apartment which was of great space and good location. Nice cheerful rooms, good attention to details, very nice swimming pools, staff was very friendly and helpful. All air-conditioned suites feature WiFi, a flat-screen TV, a fully equipped kitchen, a lounge area, an en-suite bathroom and a balcony or terrace with incredible views. Daily housekeeping is also offered at the property. Reception is available 24-hour and our team are at your service any time. Five swimming pools including exquisite infinity edges to optimise the views are dotted through the resort for the use of residents and guests. A private beauty centre and salon is available to guests of the resort and the first nine holes of the golf course is opening in mid-2016. 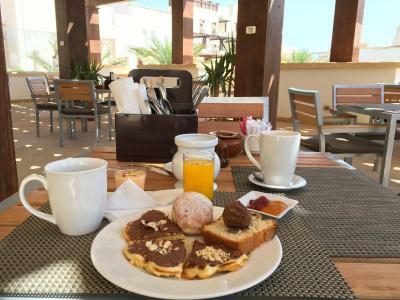 Ancient Sands is the perfect base to explore the stunning resort town of El Gouna, which offers a plethora of activities ranging from kite-surfing and diving, to shopping, golfing, swimming, spas, and much more. El Gouna is a great choice for travellers interested in water sports, relaxation and beaches. 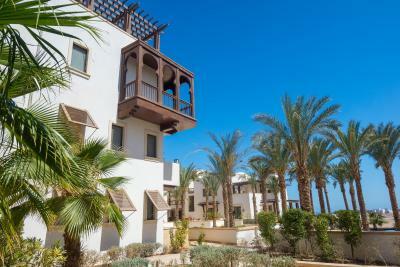 This property is also rated for the best value in Hurghada! Guests are getting more for their money when compared to other properties in this city. Ancient Sands Resort has been welcoming Booking.com guests since 31 Dec 2015. When would you like to stay at Ancient Sands Resort? This suite features a balcony and a fully equipped kitchen. - 40” TV in main living area plus 32” TV in each bedroom. - a sliding door separating the living and bedroom area. - The breakfast bar and kitchen are open to the living area, natural light flows into the apartment through glass doors that lead to the terrace. This suite has a balcony and a fully equipped kitchen. - The bedroom is very spacious with a desk area and generously sized built in wardrobes. The open plan layout combines an L-shaped kitchen and breakfast bar with a large living room. be joined to a Private Suite and create a larger suite with 2 bedrooms. - The master bedroom adjoins the living area and private terrace and an en suite bathroom with a bathtub and / or a shower. The second bedroom has a bathroom and a large terrace. - The suite has at its core a large living room with a separate kitchen and dining room. 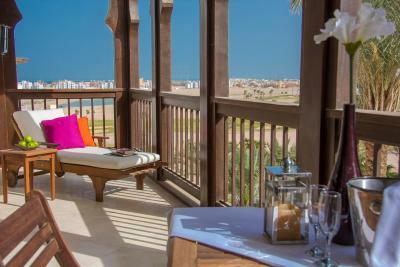 - terraces provide breathtaking views towards the Golf Course and the Red Sea. - kitchen with dining area as well as the lounge with terraces to two directions, including a pergola covered dining terrace. - A private roof lounge with a magnificent roof terrace sit atop the property. This villa has a balcony and a fully equipped kitchen. - the two bedroom Golf Villa with a Private Plunge Pool sits directly on the golf course with exceptional views looking across the lagoon towards the stunning Red Sea. - three storey property with a bedroom with ensuite bathroom at each level. - a private pergola covered terrace at the top floor. This double room features a balcony, electric kettle and bathrobe. Property surroundings – This neighbourhood is a great choice for travellers interested in water sports, relaxation and beaches – Check location Good location - show map Guests loved walking around the neighbourhood! House rules Ancient Sands Resort takes special requests - add in the next step! Ancient Sands Resort accepts these cards and reserves the right to temporarily hold an amount prior to arrival. Please note that WiFi is free in the public area and in-room WiFi is available only in Deluxe Room against charge USD 20 per day. The development around the resort not yet completed. The resort too vast. nothing centralized. Staff aren’t 5 star hotel level. The food we ordered at the pool was horrible. Big room, comfortable bed, wonderful pool. I did not like the room service and food in general at the hotel. I also did not have a great experience when checking out as i was accused of having a man in my room over 3 nights - I was both extremely insulted and shocked by this accusation as it was false. They tried to charge me for an extra guest - guess the guest must have been a ghost as I had no man (or woman for that matter) in my room during my entire stay. I really liked the property as a whole. Pools were very nice, as well as the lobby and all other main areas. My room was nice. The food is horrible, from the room service to the restaurant on site. Wall electric sockets are very difficult to use and needs plug adaptors . Staff not so great, were not helpful or informative, seemed very lazy, unavailable and/or confused in terms of hospitality service and awareness of guests needs. No concierge or support to help plan local activities, not a very child friendly resort and more suited for adults/seniors. Rooms and facilities are very clean and nice with good views. Golf course is in excellent condition and enjoyable to play. Rates and food are very affordable, good value for money. The pool area was great. Staff were friendly. No business center or printer available which was a little disappointing but everything else was great. IF you do add on the breakfast, it is delicious and great options! The staff were rude and unfriendly. The hotel was populated by many people from one country and the staff refused to a knowledgeable us because we didn’t speak their language. Good value hotel that is a bit out of they way.